PROFILUMBRA was founded in 1974, by Cav. Borgnini Arsenio, on a 5.000 m2 site, with 800 m2 of indoor space. Today the plant occupies an area of 30.000 m2, with 10.000 m2 indoors. This division is responsible for transforming coils into metal bands, sheet and sheared sheet. Part of this production is sold and part remains within the factory for use in other production divisions. Annual Production Capacity: over 40,000 metric tons. This is the company's most important division in terms of turnover and number of employees; here all types of structural shapes, including custom-made shapes, are produced with forming machines s well as bending brakes. Annual Production Capacity: over 25,000 metric tons. In this division all the finishing work on metal structural shapes is done, such as drilling, punching, drawing, shearing, welding, hot galvanizing, marking of individual pieces, etc. This is the newest division in the factory, but undoubtedly one of the most important for future growth. With its ongoing research and development, this division offers complete and sophisticated traffic safety systems, many of which have been patented, such as the longitudinal continuous band tunnel lining systems, the LUXVIA anti-glare system installed on top of concrete dividers, guard-rails, etc., road barriers with sound-deadending and soud insulatingpanels, machines for cleaning tunnel linings, and wooden paneling for existing metal barriers. Cleaning, maintenamce and overhauling of guardrails. Safety devices and systems on concrete dividers and guardrails to prevent overturning, collisions, and the breaking through of barriers, as well as noise-making devices for waking up drivers who have fallen asleep. This division deals with the construction and sale of rollers, dies, plants and equipment for processing shett metal, designed and constructed using high-tech systems. 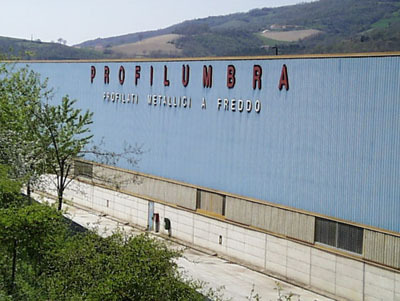 With these divisions, PROFILUMBRA has thus become fully indipendent, and today it is able to solve any type of technical problem whatsoever, with the manufacturing of complete structural shapes, also in special shapes, directly from coils. Profilumbra S.p.A. is able to provide its customers with a wide range of accessory services that complete the picture of a company that is at the service of the user. So, thanks to all of these areas, PROFILUMBRA has acquired a complete autonomy and is now able to resolve any kind of technical problem, with the realization of complete profiles, including details, derived directly from the coil. The values given in the manual are to be considered theoretic, and the user is responsible for correctly interpreting and verification the data regarding each individual usage situation.